My obsession to travel to every site related to either the fictional Count Dracula or his real historical counterpart, Prince Vlad Dracula the Impaler, grew out of a visit to Whitby, England, where part of the novel Dracula takes place. I stood on the cemetery hill where, in Bram Stoker’s Dracula, Lucy Westenra and Mina Murray spent hour after hour sitting on their “favourite seat” (a bench placed over a suicide’s grave near the edge of the cliff), gazing out toward the “headland called Kettleness” and the open North Sea beyond—while Count Dracula slept just beneath them. In my mind’s eye, I could see the un-dead Count Dracula rising at night from the flattened slab of the suicide’s gravestone to greedily drink the blood of the living. The graveyard where Count Dracula spent his days sleeping in the sepulcher of a suicide looks the part that it plays, with its weathered limestone tombstones blackened by centuries of the everpresent North Sea winds. 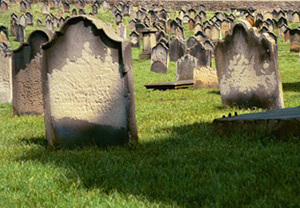 That graveyard made the novel more visible, more visceral, to me, and I wondered if the sites in Transylvania and in the remote mountains of southern Romania would evoke the same feelings. As I was to discover—they did. At that moment I decided to visit and photograph every site in England and Romania that is closely related to either Bram Stoker’s fictional Count Dracula or his historical counterpart, Prince Vlad Dracula the Impaler—to literally walk in their footsteps and to write a book about my experiences. 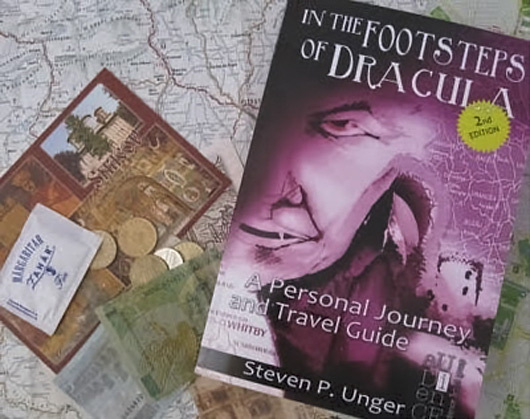 Eventually I traveled along the Dracula Trail alone, using only public transportation, to some places that I’d seen before and to others I had only dreamed of, trying my best to systematically strip away the layers of myth about Count Dracula and Prince Vlad the Impaler to find the reality within. I discovered in broken stones and parchments signed in blood why Prince Vlad’s monstrous deeds in life would brand him forever with the name of Vlad Tepes (pronounced Tzeh·pish), Romanian for Vlad the Impaler, soon after his death. In my research and travels I discovered two fascinating coincidences that link the historical and the literary Draculas. First and foremost is that Bram Stoker chose to name his villain “Dracula,” based on the translation of the Romanian word “dracul” into “devil,” never knowing that the historical Voivode(Prince) Dracula he had read about was also Vlad Tepes, with a horrific and compelling biography of his own. Bram Stoker’s Transylvania was the pipe dream of an armchair traveler with a genius for writing: real enough for the 19th Century reader, but bearing little resemblance to any Romania that ever existed. 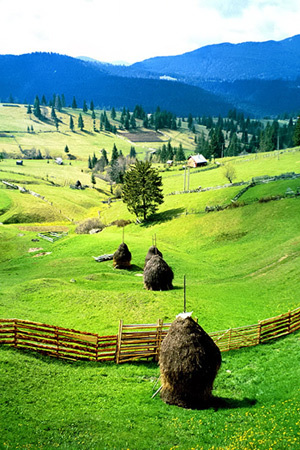 For example, Stoker wrote of “hay-ricks [haystacks] in the trees” based on illustrations of Transylvanian haystacks built around stakes, with the ends of the stakes poking out like branches. Thus, generations of Draculareaders assumed that Transylvanians put their haystacks up in trees. 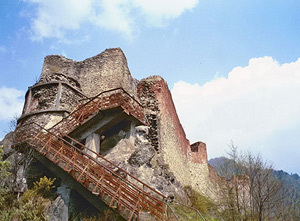 The second coincidence is the uncanny resemblance of thereal Castle of Dracula—Vlad Tepes’ fortress at Poenari, which Stoker had no knowledge of—to Count Dracula’s fictional castle in Transylvania. Perched on a remote peak near a glacial moraine in the Fagaras Mountains of southern Romania and mirroring Count Dracula’s fictional castle at the top of the Borgo Pass almost stone for stone, Poenari remains pristine and almost inaccessible. 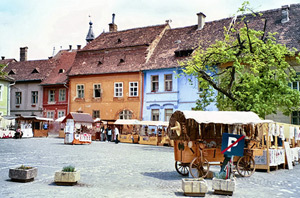 I entered Sighisoara’s Upper Town. All at once I was in the middle of a perfect storybook medieval village enclosed by thick fortress walls, with cobblestone streets and Easter-egg-colored houses leaning every which way. Guarding the town square was a spire-roofed and turreted 14th Century clock tower replete with carved wooden figures that circle a track to mark the passage of time. In one window, a drummer plays to signal the hours; below the drummer, the angel of the night replaces the angel of the day at the final stroke of midnight. In another window, gods and goddesses appear, changing for each day of the week. 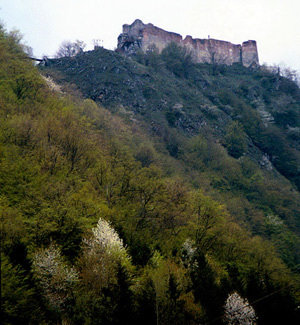 But let’s get back to Poenari, the real Castle of Dracula. I had traveled to other remote, forbidding places before entering the almost lightless forest of Poenari. Near Albania’s southern border, I hiked the Vikos Gorge, a dozen miles from the nearest stone-housed village. I baked beneath the unrelenting sun of the Timna Valley close to the Red Sea, where 120° in the shade is considered picnic weather. 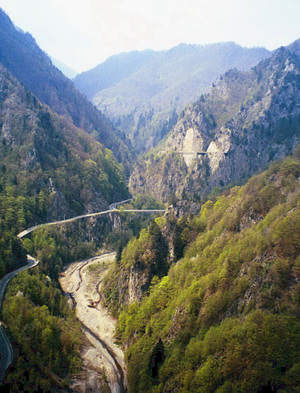 But never before or since have I felt the apprehension and isolation I did while climbing to Vlad Tepes’ mountaintop fortress at Poenari. The forest was as quiet as a tomb; I can’t recall hearing the song of even a single bird. The ascent was exhausting. At last I arrived at the lone approach to the fortress, a wooden footbridge (see top left of photo). Of all the places I explored that are associated with Vlad Tepes, only at Poenari did I feel that he was somehow still keeping watch. 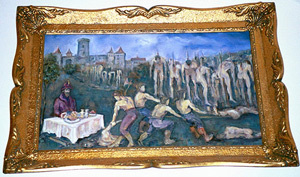 Thousands of boyars and their families had been force-marched there from Targoviste to die rebuilding the castle for Prince Vlad; it was here that his treacherous brother Radu stormed the fortress with cannons, reducing the once courtly residence into broken turrets and formless rubble. And it was here that Prince Dracula’s wife cast herself from the highest window of the eastern tower, choosing a swift death over the torture of the stake. The view south from the fortress is straight down, to the Arges River far in the distance, and even farther, the road to Curtea de Arges. Romar Traveler and other online publications. and with free delivery worldwide from www.bookdepository.co.uk.